A little over an hour ago, the Nintendo Fall Conference 2010 ended, offering up another tantalizing look at the upcoming 3DS handheld, among other things. Unfortunately, a large portion of the conference was dedicated to things that were mostly already known – such as an updated “Wii Remote Plus”, containing a built-in WiiMotion+. 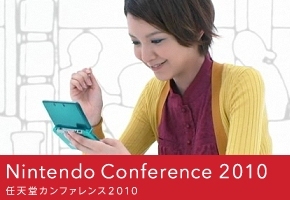 The big news of the event, of course, was more details on the Nintendo 3DS, and a dominating percentage of the conference was dedicated to discussing its features. The system, in general, feels like a bit of a departure for the Nintendo we’ve come to understand since the launch of the original Nintendo DS and the Wii. Recent rumors and developer chatter have been drawing comparisons between the 3DS’s horsepower and consoles like the Xbox 360 and Playstation 3 – a far cry from the “suped-up Gamecube” that is the Nintendo Wii. This was further re-enforced by what Nintendo showed of the 3DS at this Fall event – such as the 3DS’s “Tag Mode”, which can share and store data from any nearby players. Tag Mode is a natural evolution of similar concepts currently in-use with the original Nintendo DS, with one key difference: on the DS, sharing is only supported if you’re playing the game you want to share data from. The 3DS, on the other hand, stores the shared data in the game’s internal memory, and will transfer it to any nearby players regardless of what is in the 3DS cartridge slot. For a company so seemingly behind the curve on connectivity, this marks a major step forward, as does the 3DS’ ability to silently connect to the internet while in sleep mode in order to download things like leaderboard updates, time trial ghosts, and free software. If that isn’t progressive enough, Nintendo has also partnered with one of Japan’s largest television networks – Fuji-TV, to bring daily, 3D-enhanced video content to the 3DS. Unfortunately, at this time, there have been no comments on a North American or UK equivalent services. Progressive steps forward in connectivity or not, that won’t stop Miis from coming to the 3DS. Though the meticulous process of creating your own Mii from scratch still exists, you can also use the 3DS’s dual cameras to take a picture of your face and automatically generate a personalized Mii from that. Mii Plaza from the Wii will also be featured on the 3DS, with the added benefit of being able to share your Miis with other nearby players with Tag Mode. Sharing Miis across the internet will be easier than ever, too, thanks to a feature that allows you to print out a barcode for your Mii. This will allow other 3DS users to photograph that barcode and receive that Mii. A 3DS Virtual Console was also finally revealed, though so far only Gameboy and Gameboy Color games are confirmed. Apparently, though, the 3DS VC will display these games in 3D – much like the “retro game demos” Nintendo was showing at E3 earlier this year. Something Nintendo has been making a big deal about with regards to the 3DS is third-party developer perception. With the Wii, many third-party developers began to complain that their biggest competitor was Nintendo itself; thus, with the 3DS, Nintendo is making a serious effort to spotlight third-party developers first, and they once again ran a reel showing many developers pledging support for the 3DS: Capcom, Kojima Productions, Square-Enix, Tecmo, and more. Capcom in particular seems to be supporting the 3DS, with a 3DS version of Super Street Fighter IV, not one, but two Resident Evil games, and even an announcement of the long-awaited Mega Man Legends 3. All of this and more, coming February 26th 2011 in Japan, for ¥25000. As for the rest of the world, Nintendo would only say “March 2011” – and no price given, though ¥25000 conveniently comes out to about $299 USD – almost double what the original Nintendo DS was priced at. However, the 3DS makes up for this by not only coming packed with a 2GB SD card for data storage, but a battery-charging cradle, too. Some developers are still trickling new 3DS info out – we’ll keep you up to date on any important developments.